The latest disc to be featured here is an unusual Target CD that I found recently at a book/media sale for just $4. It is a West German Target pressing of Linda Ronstadt Greatest Hits that was issued for the Columbia House Music Club. This disc is likely among the earliest to be issued through Columbia House, and I assume it is quite rare. The disc is on the Asylum label and bears catalog number E2-106. The E2 prefix is typical of a Columbia House release, and the ‘E’ stands for Elektra, the parent label of Asylum. This catalog number is derived from the one used for the retail release, which is 106-2. Pictures of the disc and back insert for the Columbia House issue are shown below. The disc is very similar to the retail West German Target pressing. A key difference is the catalog number, as already mentioned. Additionally, the Columbia House disc lacks the “GEMA” symbol beneath the CD format logo at 3 o’clock. The Columbia House issue has “MADE IN WEST GERMANY BY POLYGRAM” printed along the perimeter of the disc, but it also has “MADE IN W. GERMANY BY PDO” stamped on the play side near the center hole. Thus, it was pressed at the West German PDO plant (Philips-DuPont Optical). The back insert lacks a barcode, which is typical of early Columbia House releases. It was printed in the U.S. It has “Manufactured by Columbia House Under License” printed along the bottom edge. This is the third unusual Target pressing of Linda Ronstadt Greatest Hits that I have obtained. The other two are a West German pressing bearing catalog number 64106-2 instead of the common 106-2 and a U.S. PDO pressing with catalog number 106-2. Both of these are early retail issues. There also exists a U.S. Target pressing for Columbia House with catalog number E2-106. 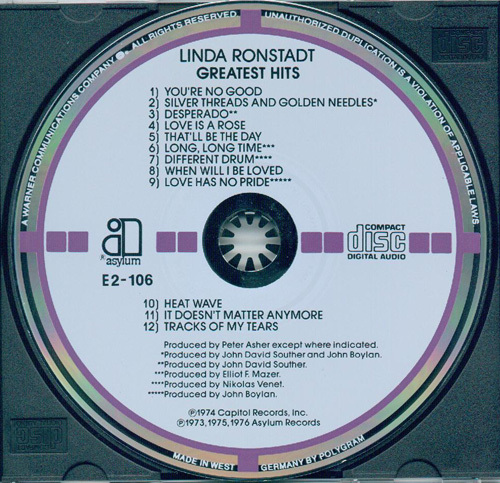 The West German Target CD of Linda Ronstadt Greatest Hits for the Columbia House Music Club (Asylum, catalog number E2-106). The disc has “MADE IN WEST GERMANY BY POLYGRAM” printed along the perimeter and “MADE IN W. GERMANY BY PDO” stamped on the play side near the center hole, thus indicating that it was pressed at the PDO plant. The matrix code is “7559 64106-2 2893 039 02 #”. 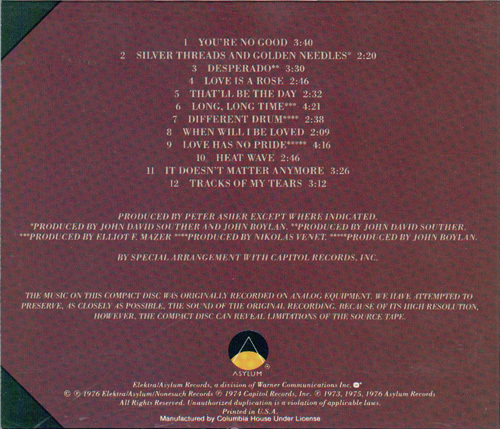 The back insert for the West German Target CD of Linda Ronstadt Greatest Hits for the Columbia House Music Club (Asylum, catalog number E2-106). As indicated, it was printed in the U.S. Note the text “Manufactured by Columbia House Under License” along the bottom edge. There is no barcode, as is common for early Columbia House issues.